We study the fragility of discretionary liquidity provision by major financial intermediaries during systemic events. The laboratory of our study is the recent collapse of the auction rate securities (ARS) market. Using a comprehensive data set constructed from auction reports and intraday transactions data on municipal ARS, we present quantitative evidence that auction dealers acted at their own discretion as “market makers” before the market collapsed. We show that this discretionary liquidity provision greatly affected both net investor demand and auction clearing rates. 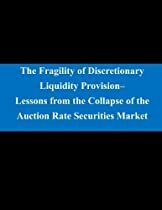 Importantly, such discretionary liquidity provision is fragile. As auction dealers suffered losses from other financial markets and faced increasing inventory pressure, they stopped making markets. Moreover, the drop in support occurred suddenly, apparently triggered by the unexpected withdrawal of one major broker-dealer.